We invite you to experience a new kind of appliance shopping in The Living Kitchen at Capital Distributing. Get hands-on with the entire line of Sub-Zero, Wolf, and Cove products in full-scale kitchen environments. 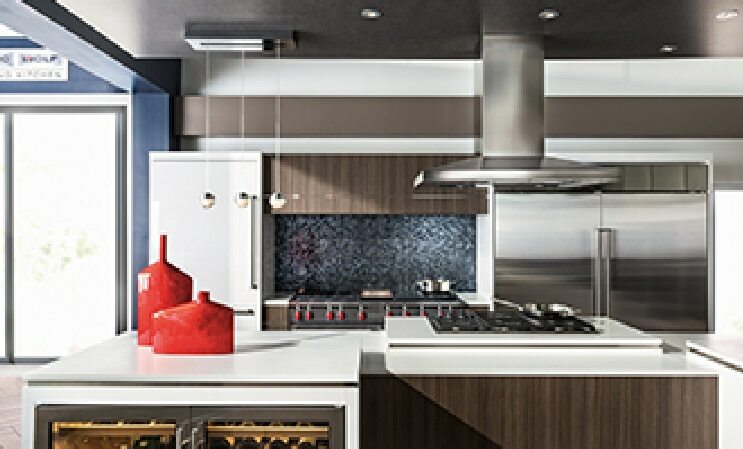 So before you start designing your dream kitchen, stop by Capital and take the time to twist the knobs, open the doors, and even test drive many of our Sub-Zero, Wolf, and Cove appliances. Twist knobs. Open doors. Size up shelf space and compare capacities. The Living Kitchen gives you full access to every square inch of the appliances you’ve been eyeing in magazines, brochures, and online. Dual fuel or induction? Gas or electric? Integrated or built-in? Get hands-on with a diverse line of Sub-Zero, Wolf, and Cove products under one roof to see which appliances are right for your kitchen. Rather than row after row of isolated appliances, The Living Kitchen puts Sub-Zero, Wolf, and Cove products side by side in their natural environments to help you curate your new space. Capital Distributing is the place for home appliances and turn-key installations. We have a multi- purpose showroom dedicated to showing how today’s appliances integrate into real kitchens.